Leeds Trash and Limb Pickup Service for which a small fee is charged is intended for removal of limbs, not trees and for individual household items, not whole houses of furniture, appliances, etc. 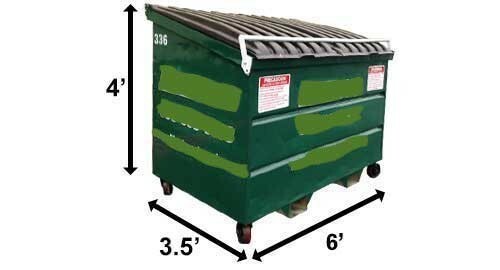 Generally speaking, if you had a contractor cut a large tree, have a large amount of construction material, cleaned up an entire lot etc., you are responsible for having a dumpster, taking that material to the dump yourself or having your contractor remove the material. Some individuals are abusing the trash and limb pickup service which sometimes fills up the truck with material from just one household; thereby disrupting normal route service, causing excess wear and tear on equipment and causing some patrons not to be serviced on the scheduled pickup date. If you are in doubt about what is an acceptable size load to put on the street for pickup, here is a diagram example that could assist you. The City will liberally interpret rules and help where possible, but your help is also needed if we are to provide this service to everyone on an equitable basis. Material from commercial contractors and piles obviously outside the intended scope of the service will be left unloaded. Our goal is to provide each resident with good service. Thank you so much for your cooperation.